Bicycle owners have been advised to use better locks. SOME 4,950 BIKES were reported stolen in Dublin in 2014 – more than 13 per day. 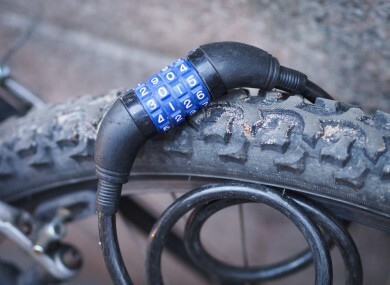 There is a large degree of under-reporting and, based on survey data from the UK, the actual number of bike thefts is likely to be a multiple of that figure. It shows a jump of 162% since 2008, when 1,873 bikes were reported stolen in the capital. More people purchased bicycles the following year when the Bike to Work scheme was introduced. Dublin City Council (DCC) set up a Bike Theft Working Group earlier this year to help tackle the problem. It recommends that cyclists use U-locks with ‘Sold Secure’ accreditation as their main lock, with a cable or chain and padlock only to be used as a secondary lock. Lord Mayor Críona Ní Dhálaigh launched DCC’s Bike Security Campaign today. “The aim of the campaign is to raise awareness of the issue of bike theft and alert cyclists to the need to use higher quality locks. It is vital that cycling is supported and encouraged in the city and a big part of this is to reduce bike theft,” she said. A Dublin Cycling Campaign survey from December 2014 showed that 66% of bikes stolen in Dublin were locked using cable locks or sub-standard U-locks or chain locks that can be easily cut through and offer limited security. The December 2014 survey notes that one in six victims of bike theft in Dublin stop cycling altogether and a further 26% reduce the amount they cycle following a bike theft. The working group has representatives from Dublin City Council, An Garda Síochána, the National Transport Authority, Dublin Cycling Campaign and bike shops. Email “At least 13 bikes are stolen every day in Dublin”. Feedback on “At least 13 bikes are stolen every day in Dublin”.